I initially struggled with what to write to commemorate National Library Week, which runs from April 10-16, and National Library Workers’ Day, which is observed this year on April 12. It would be easy to write solely about myself and my own experiences (I’ve worked in libraries for almost 10 years now) but that didn’t seem quite right. It felt almost selfish, and that is the exact opposite way I would describe my co-workers, both past and present. In fact, library workers are some of the most selfless, caring, and dedicated people you’ll ever meet. They strive to make a difference in the communities they work in to help make sure everyone has access to the resources they need to succeed. They’re the ones who make the library what it is – one of the most important institutions in any community. A few years ago, I heard someone describe libraries as one of the few places left in America where everyone is equal. No one gets special privileges because of how much money they make or who they know. The same books, movies, and periodicals are available to anyone. People of all different socioeconomic backgrounds mingle together at programs and events that interest them. No one gets turned away from the library, and staff are there to assist everyone with their needs. Everyone has to follow the same rules and has access to the same information. Though it may not seem that remarkable, since many cities and states are allowing businesses to put restrictions on who can use their services, it’s actually quite important that libraries exist so that everyone can come and get the information and services they need. Access to information and intellectual freedom are the cornerstones of the public library. One of the ways the role of libraries has changed is that computers and internet access have become just as important as books for many patrons. I’ve lost count of the number of stories I’ve heard of patrons saying they got a job thanks to access to the public computers and other resources at the library. The public library has books and databases to help people find almost anything too. Whether you want to learn a language, research your ancestry or anything in between, there’s more than likely a database for that. Librarians and library workers are a wealth of knowledge on a number of subjects and are always willing to help patrons find the answer to their question. Intellectual freedom is extremely important too. Most libraries don’t limit access to any books or websites, allowing people to make their own decisions about what they want to see and read. Banned Books Week, which is celebrated every September, further illustrates why intellectual freedom is important for libraries and why they are often at the forefront of the fight against censorship. Libraries are also places where lifelong connections are made. Whether it be personal or in the community, library workers often make connections with the populations they serve that can last a lifetime. Children who attend a particular librarian’s story time often come back to the library as adults because they have those fond memories from childhood. Librarians who attend the same outreach events year after year on behalf of the library become a familiar face and bring people in. Many library workers are recognized in their communities for a number of reasons, including outreach events and in-library customer service, and make friendly connections that can last a lifetime and even extend outside of the library. Library workers have to deal with a lot too. Many people tend to think that working at a library is a nice, quiet job and that we have a lot of spare time to read. Though we all wish that was the case, that’s practically the opposite of what it’s like to work at a library, especially a public library in a major city. The primary function of library workers is customer service, and just like any customer service worker, we get our fair share of abuse. People get upset about fines or that the item they want isn’t on the shelf, and unfortunately staff often take the brunt of their frustrations. In many urban cities, homelessness is also an issue that many libraries have to deal with, and there is sadly no perfect solution. But one of the best things about library workers is their sense of compassion. They help the most vulnerable people on a daily basis and connect them to resources and services that can help them. Though libraries aren’t community centers and librarians generally aren’t social workers, they’re willing to take on whatever tasks they need to in order to help out the communities they’re there to serve. It’s important to realize how much library workers love what they do. Most of them have to work at least one, if not multiple weekends each month and work shifts that run late into the evening to serve their communities. They have to be prepared to deal with almost anything, and they take it all in stride. Though not everyone who works at a library intended to make that their career, they all share a passion for the work they do and support the mission of libraries. Whether they shelve books, work at the circulation desk, or perform reference tasks, they all contribute to making the library a pillar in their community. When it comes down to it, libraries are essential to a functioning society. There is something there for every person, whether they take advantage of that or not. Without libraries and library workers, our communities would be much worse off and would be missing a vital resource for everyone. 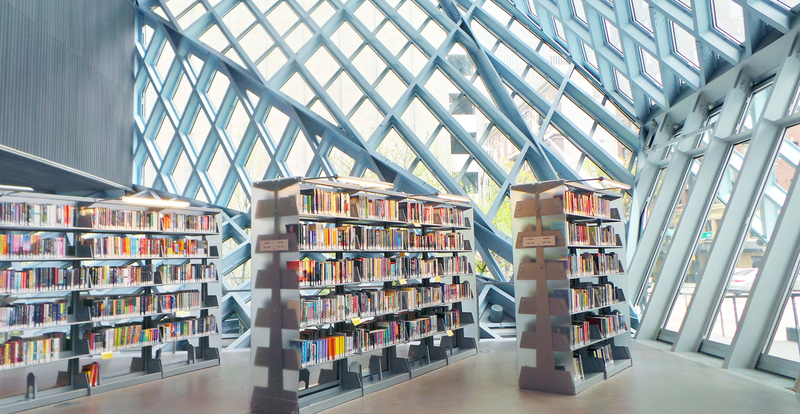 Libraries aren’t perfect, but nothing is. They are, however, there to try to help meet all of your needs. And as for us library workers? We’re always glad you came. Well put. Ben Franklin knew the importance of knowledge being free.